Four years ago this month, Copyblogger Media was born. Up until that point, I had launched several businesses off of Copyblogger, with several smart partners. Each of those individual businesses were killing it and had me involved, but those smart individuals weren’t collaborating with each other … because why would they? The five of us convened in a Denver conference room – the first time the group had ever met in person. In just three hours, we worked through the seemingly impossible task of merging five companies into one new entity, with everyone’s equity interest and responsibilities in place. How was that even possible? In short: shared vision. We all agreed to come together to build something bigger than we could build separately. And just like that, we were a new venture of 15 people who had to quickly learn to work together if we were going to accomplish our goals. Today – as a growing group of 42 – we’re revealing the result of our combined efforts. While four years may seem like forever in Internet time, it seems to have all worked out perfectly. During those four years, we built the parts of our ultimate vision while we grew revenue. Because we’ve never taken venture capital, we had to operate like a real company – one that provides value to paying customers while patiently executing on a larger goal. First we worked to make StudioPress the go-to source for WordPress design. Then we launched a premium WordPress hosting division called Synthesis to make sure we had the infrastructure aspect down cold. Scribe has rapidly evolved from simple SEO copywriting software into the patent-pending suite of audience optimization tools it is today. We created sophisticated “no-code” development tools that power our own membership areas, lead generation, and digital sales engines. And then we did the hardest thing – created a website deployment system that allowed for amazing ease-of-use combined with maximum security and performance. Everything we built was for our own use first, with WordPress at the core. We are, after all, doing the same work to build our business that our audience and customer base does – so it makes sense that we built tools good enough for our own use. Since inception, our goal as a company was to take those parts and fuse them into a complete solution for content marketers and online entrepreneurs. A solution that our own editorial team of poets and misfits could use to build anything they want … without worrying about technology. Not because we needed something to sell. Instead, a solution we’ve used ourselves to build a $10 million-a-year company out of a simple blog, and by practicing what we preach. Today, we’d like to invite you to check it out, free of charge. Okay, great. So what’s the Rainmaker Platform anyway? Great question. Let me give you the bullet points first. It’s been battle-tested by over 1,000 tough early adopters over the last five months, and now it’s ready for you to test drive – at absolutely no charge. What can I build with Rainmaker? Another great question. Let me give you some concrete examples of sites you can build. Copyblogger.com alone gets over 500,000 unique visitors a month without advertising. It’s essentially a static home page, a blog, a collection of landing pages, and a combination free/paid membership area, which includes a forum in addition to all sorts of scheduled and archived content. You can build a site just like Copyblogger with Rainmaker. Or, let’s look at StudioPress, which sells hundreds-of-thousands-of-dollars in digital products every month. It’s essentially a collection of sales pages with a blog, a checkout process, and a protected area for delivery of the purchased products. You can build a site just like StudioPress with Rainmaker. Want to build an online training course, powered initially by a podcast, like at New Rainmaker? Whether for lead generation or as the product itself? You guessed it … New Rainmaker is built on Rainmaker. And if you want a custom design like any of those sites, you can do that as well on Rainmaker. But the $10,000 to $30,000 (or more) in development work some would charge you just to build the bones of the site is off the table, which is nice. Plus, a full suite of podcasting features. Research, outreach, and optimization tools. 27 cutting-edge, future-proof HTML5 responsive designs. And much more. In fact, Rainmaker does way more than I’ve mentioned here. But you need to experience that for yourself with the free 14-day trial. What’s coming next in Rainmaker? You’re on absolute fire with these questions. Here’s a list of seven exciting enhancements coming within the next six months that will become part of a more advanced (and more expensive) Professional plan. 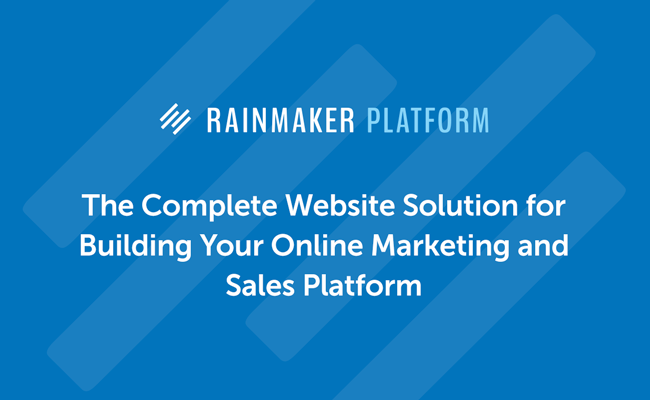 We’ve built that platform with Rainmaker. But we’re creating course creation tools that constitute a true learning management system — one that will help you with the administration, documentation, tracking, reporting, and delivery of e-learning courses and training programs. What does that mean? Effortlessly create an online course without a developer, optimize your course content based on student behavior and feedback, run quizzes and surveys, and drip out your content (either paid or free) exactly as you want to, plus much more. This is one of the most important technology applications that you’ll ever put in place for online marketing. And finally, it won’t cost you a ridiculous amount of money as with the current solutions. Rainmaker’s automation and adaptive content features will allow you to tag, add, delete, and manage customers or prospects from your various email lists, build specific interest lists based on real-world actions on your site, nurture leads in a way that’s sensitive to their inbox, allow you to create different content experiences for different people, and much more. You can use Mailchimp, Infusionsoft, Aweber, or the other popular email services we’re in the process of adding. Or you can choose the integrated add-on Rainmaker email service we’re working on right now. Either way, Rainmaker Professional will go to work for you in previously unimagined ways. As I mentioned, all of these exciting features are coming within six months. And you can bet your life existing Rainmaker users of the Standard plan will get a better deal when the Professional plan is introduced. So, take Rainmaker on a free test-drive today. Next article: The Lede: Are You Overlooking This Cornerstone of a Smart Content Strategy?